Oh Hey There! : My Curly Hair Guide. This is simply a guide for someone who is maybe just starting to embrace their hair and is looking for a fingerpost in the right direction. Ultimately everyones hair works differently, these are just some bits of advice that have helped get me through the last year! 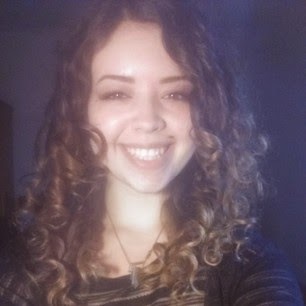 My hair after lots of damage and then around a year of following these rules! It might just look like one big mass, but it is made up of so many tiny individual bits. Every curl is made up of lots of separate strands of hair that fit together. The more we touch them the more they will pull apart causing frizz. But we have to touch it?! How else do we get product in? The way we touch our hair will have different effects. Raking through the hair with a fine tooth comb will disperse the curl a lot, whereas using the fingers or a wide tooth comb will break them up a bit to detangle but the curls will still be defined. The best way I find to help with curl formation is twirling or twisting. Using your fingers to encourage the curls to fit together can work wonders. I don't know why I overlooked this for so long. If a curl isn't sitting how you want it to, take it into your own hands! Literally. When it is wet apply products and then just curl it around your finger or twist it. When we touch our hair can have a great effect too. The wetter the hair the more able it is to reform the curls so touching the hair when it is holding onto more water, i.e asap after the shower is the best time apply product. It is also the best time to apply product as the water will help the product disperse easier and smoother throughout the hair, which helps avoid that crunchy look. Your hair will look at its best when it is in its best condition. When hair is damaged and in bad condition it will be frizzy, dry and be unable to hold onto its shape. When it is healthy it will be shinier, smoother and behave its self much better. Be nice to it and it will return the favour. I do conditioning masks a few times a month on my hair. I usually make my own, with ingredients like coconut oil. They make the hair softer, shinier and after I have done treatments like this I find myself needing less product for a while. I would recumbent treating your hair maybe once/twice a month to give it a boost. We can't ignore that they are bad for the hair. They are, but sometimes we still wanna use them and thats cool too. I have to admit I am much happier after ditching them (for the most part, I still straighten occasionally) but I don't want to limit myself so making sure that my hair is in great condition and finding good heat protection is key. For so many years when straightening I didn't bother to take care of my hair or use protection and I am paying for it now. Learn something new! Learning about you hair, the things it is made of, the things it needs, is vital. I didn't realise how much my hair was missing until I sat down and made myself do some research. It takes less then you think and learning to basics can be done in less than half an hour. There are some really basic things that knowing can help make a big difference. Click here for a link to my Curly Hair Terminology, that includes some of these basic things. What we eat has a big impact on our hair. If we are eating badly, skipping meals or starving ourselves then our hair will suffer and won't grow properly. Some of the key vitamins and minerals we need for our hair are B vitamins like B6 and B12, Iron, Vitamin C, Beta Carotene and Zinc. Also, DRINK ALL THE WATER. Products are often designed for certain hair types, try to pick ones for curly hair or better yet buy them from a company that specialises in curly hair. As we can see from most advertising, a lot of the big brands like loreal, don't seem to know what curly hair is, they seem to think that means slightly wavy, which leads me to question. Look at product reviews and what other people have said about it. If someone has a similar hair type to you and says that it was horrible then maybe try another product. At the same time though, what works for one person may not another for all sorts of reasons, don't completely limit yourself but maybe use it as a guide. Also find out what you hair types are and this will really help you find products that are great for your hair. About half an hours worth of research can save so much time and money in the long run. Check the ingredients in the product. If you have time, find out what all of them actually are. You will be amazed at all the crap that goes into them. I try to stick to products with as few ingredients as possible or ones that have as many natural ingredients as possible. So many products will claim to be a 'moisturising' product and then have chemicals in them (perhaps for colour or smell) that are drying. I always think that starting with as few products or as little of a product as you can is better. Build it up if you need more. I used to always ignore the advice on the product for application, thinking it would never be enough, put way more on and then wonder why my hair is crunchy. Its human nature to think we know better but if you are using a good product, from a company that knows what it is doing, they are saying it for a reason. If you are paying £7 for a hair mask with about 30 ingredients that boasts its great coconut oil content, why not just buy some coconut oil? Or worse, about £25 for a bottle of shampoo containing 'Moroccan Oil' or Argan Oil its real name, what are you doing? You are basically paying for this ingredient at an ridiculous rate. The product might only contain about 3 drops of the stuff and you could buy an entire bottle of the oil, for the price of one bottle of shampoo. Companies boast that this product has been used for centuries by people from 'distant' places, but they weren't using it in a highly overpriced shampoo. I am not saying don't buy expensive products, I am a big believer in if something works, don't question it. I'm not saying make everything completely yourself just be savvy. Most of my favourite hair things consist of about 2/3 ingredients and I have made myself. Nice intro guide - As a fellow curly girl I will definitely bookmark your blog. Thanks so much :) Let me know if you have any comments or advice! How to Elongate Curly Hair Without Damaging! Rosewater ACV Make-up Remover and Toner. 3 Ways to Preserve Curls Overnight. Flaxseed & Honey Hair Gel - Update and Results. How to Get Some Shape and Definition to Curls. Oils for Curly Hair - A Beginners Guide. Curly Hair & Swimming Advice. Curly Hair Terminology - A Beginners Guide.